Concerns over the cost and destructive nature of dental treatment have led to the call for novel minimally invasive, biologically based restorative solutions. For patients with toothache, this has resulted in a shift from invasive root-canal-treatment (RCT) toward more conservative vital-pulp-treatment (VPT) procedures, aimed to protect the pulp and harness its natural regenerative capacity. 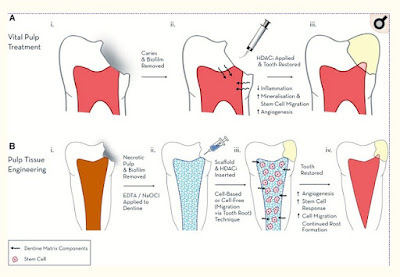 If the dental pulp is exposed, as long as the infection and inflammation can be controlled, conservative therapies can promote the formation of new tertiary dentine in a stem cell-led reparative process. Crucially, the volume and quality of new dentine is dependent on the material applied; however, currently available dental-materials are limited by non-specific action, cytotoxicity and poor clinical handling. Looking to the future, an improved understanding of the cellular regulators of pulpal inflammation and associated repair mechanisms is critical to predict pulpal responses and devise novel treatment strategies. Epigenetic modifications of DNA-associated proteins and the influences of non-coding RNAs have been demonstrated to control the self-renewal of stem cell populations as well as regulate mineralised tissue development and repair. Notably, the stability of microRNAs and their relative ease of sampling from pulpal blood highlight their potential for application as diagnostic inflammatory biomarkers, while increased understanding of their actions will not only enhance our knowledge of pulpal disease and repair, but also identify novel molecular targets. The potential therapeutic application of epigenetic modifying agents, DNA-methyltransferase-inhibitors (DNMTi) and histone-deacetylase-inhibitors (HDACi), have been shown to promote mineralisation and repair processes in dental-pulp-cell (DPC) populations as well as induce the release of bioactive dentine-matrix-components.